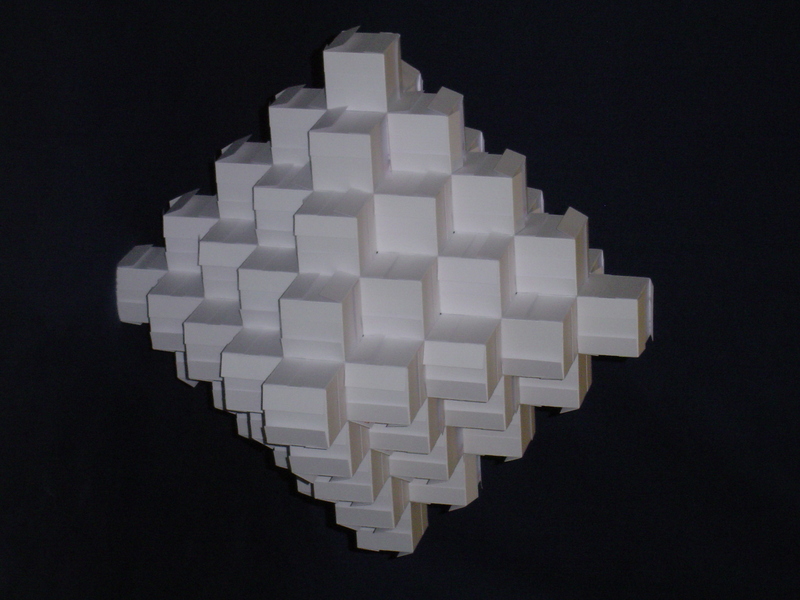 On this page are collected images of modular origami models made of business cards. They are all grouped together while "regular" modular models made out of square pieces of paper are put on separate pages depending on the subject. This is because business card origami has some peculiarities and through the choice of material is even more different from traditional origami than standard modular origami. Business card units are designed differently than modules for regular paper: due to cardboard's greater stiffness, these units usually have far fewer creases (even as few as two) and rely to greater extent on the paper's rigidity. Still, for business card models, I follow the same guidelines as for my other origami, i.e. cutting or glueing are not allowed. I would like to thank all the people, who donated their business cards for the noble purpose of origami. Special thanks go to (in alphabetical order): Katarzyna Dobrowolska and my colleagues from NetSprint / Newspoint. Made from Michał Kosmulski's swallowtail module (12 modules). 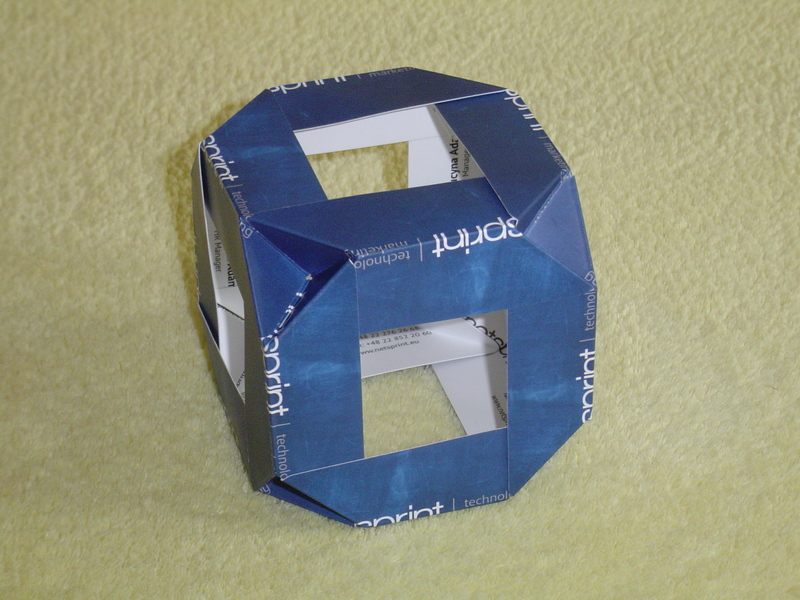 Made from Business card cube module (12 modules: 6 for the body and 6 for coating). Public transport tickets were used for the units. 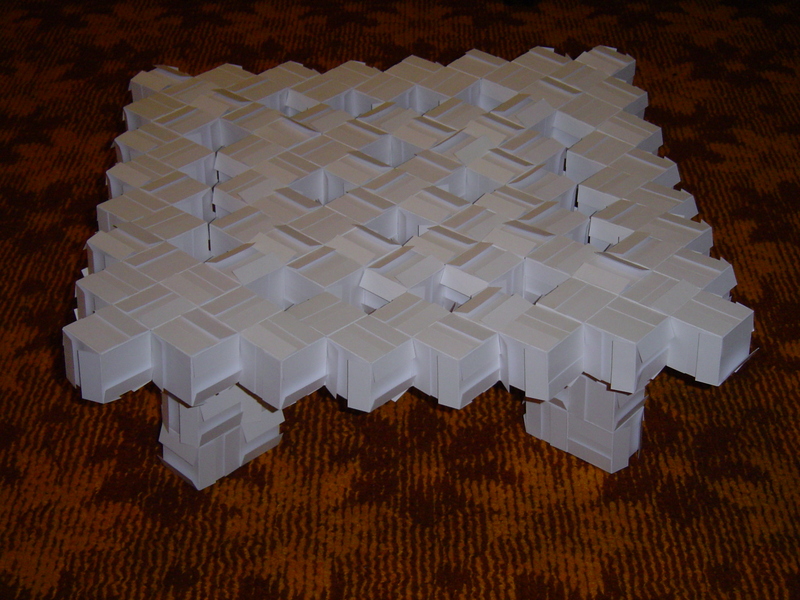 Made from Business card cube module (120 modules). 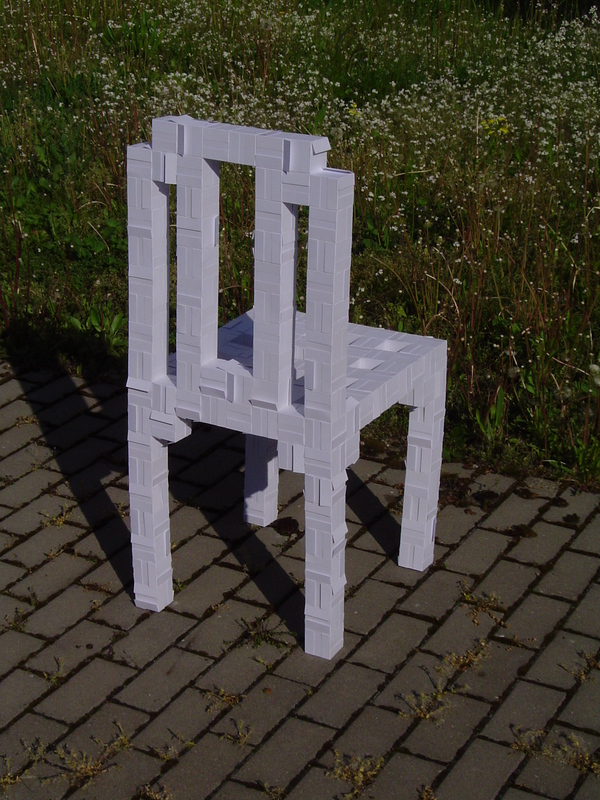 Made from Business card cube module (192 modules: 120 for the body and 72 for coating). 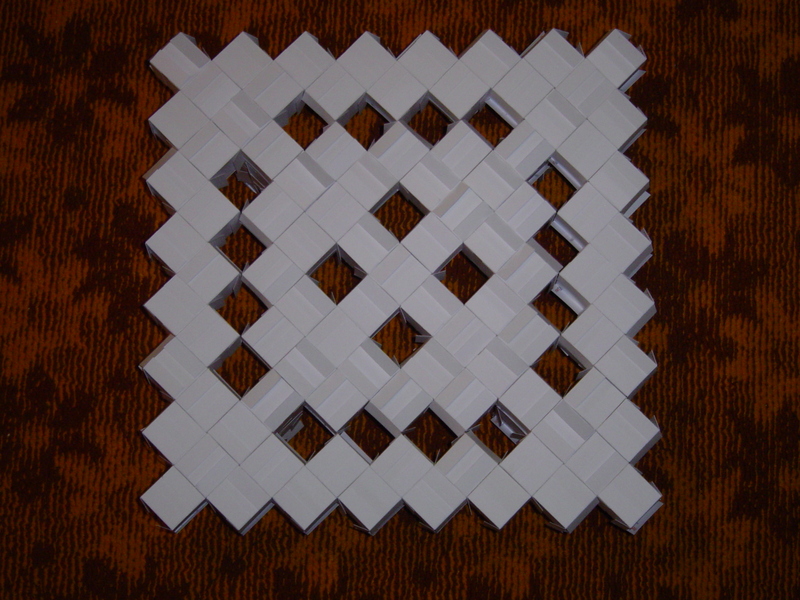 Made from Business card cube module (612 modules). 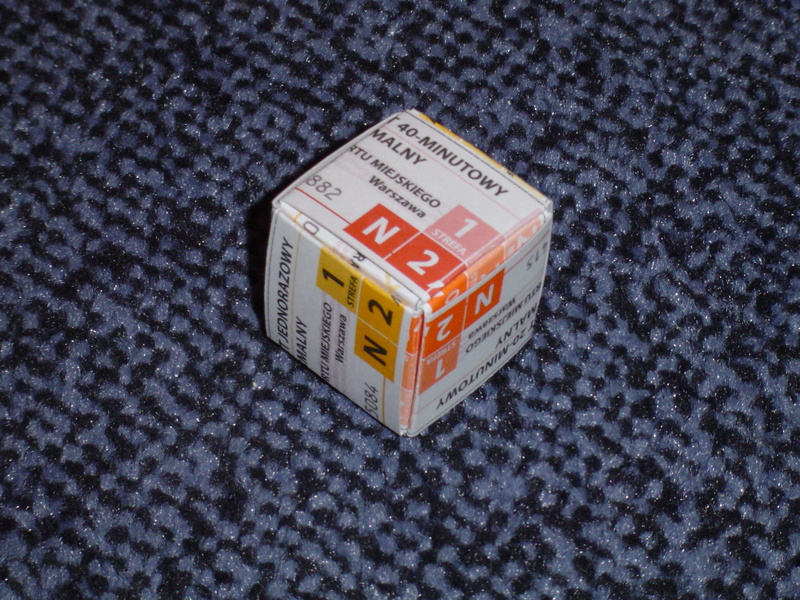 N(n) = 8n-4 for n >= 2 (5 and 1 for n 1 and 0, respectively). 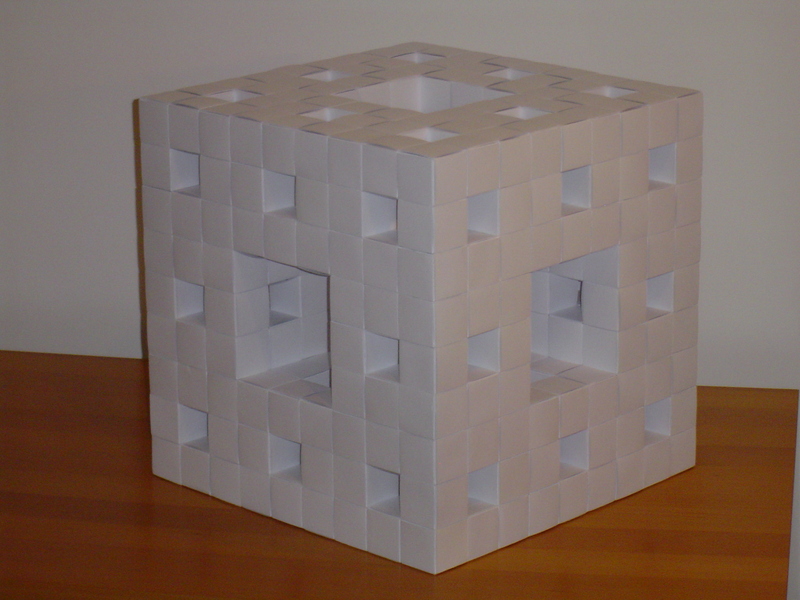 Made from Business card cube module (624 modules). Just like the pyramid, this is a shell with an empty inside. 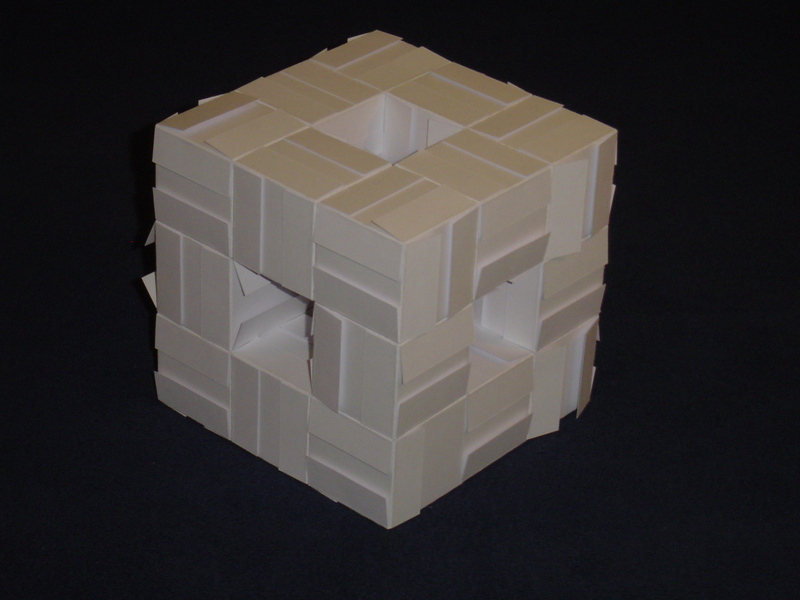 Made from Business card cube module (702 modules). A Japanese style short-legged table. 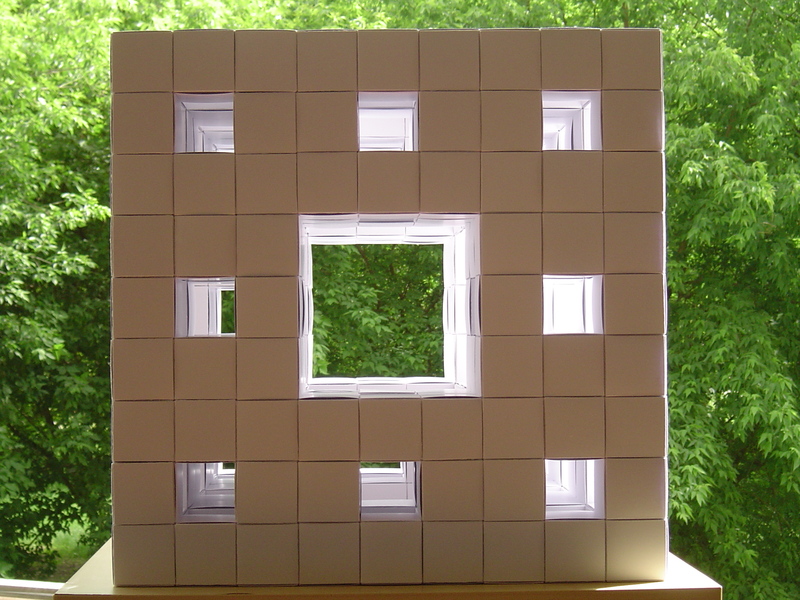 Made from Business card cube module (708 modules). While it may not be obvious at first, this model has some features which make it strikingly similar to the table model shown above. 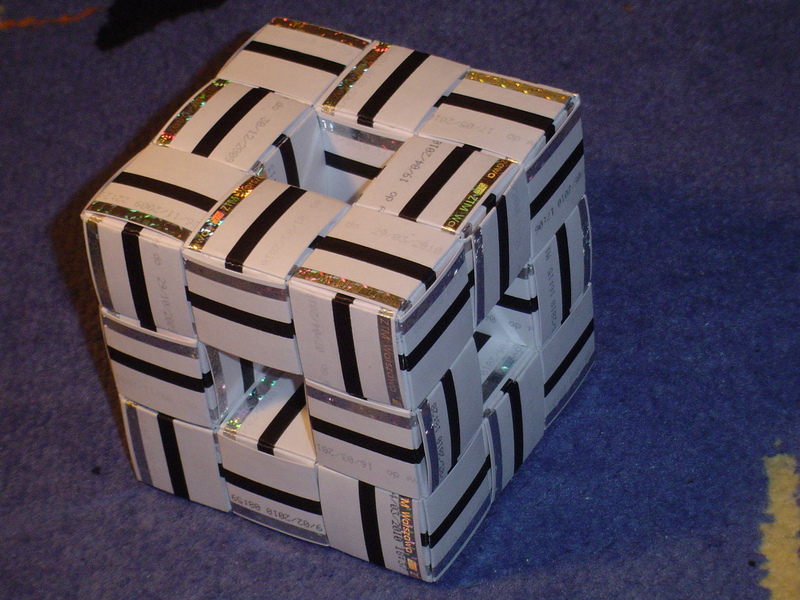 Made from Business card cube module (828 modules). This model is the size of a real chair. Unfortunately it can't support enough weight to be sat in. 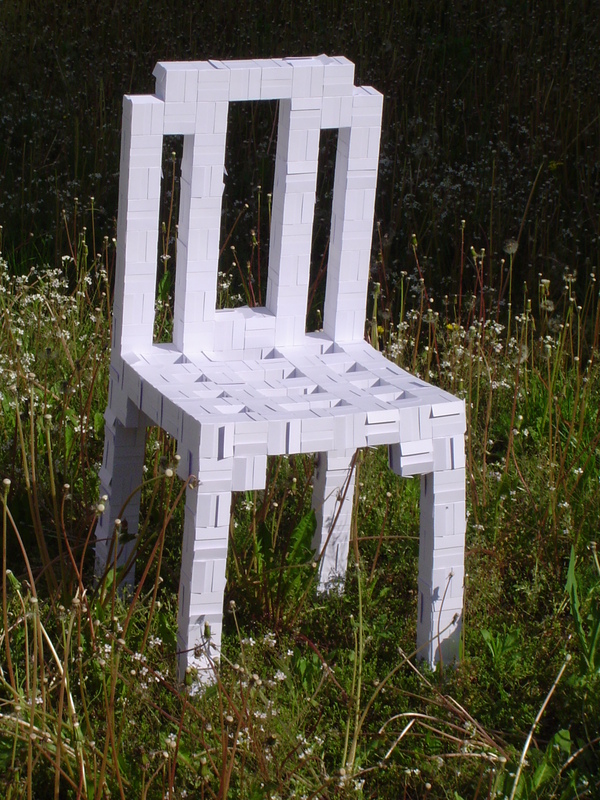 Made from Business card cube module (3456 modules: 2400 for the inside and 1056 for the outer shell). Business cards 5x9 cm in size were used to fold this piece. Placed side by side, they would cover an area of over 15 m2, the size of a large room. 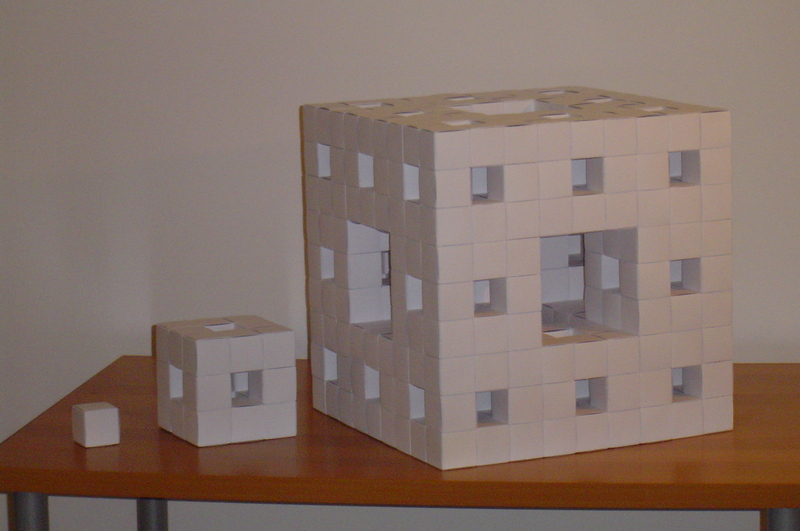 The last of the images shows three Menger Sponges side by side: level 0, level 1 and level 2. This shows nicely how each higher level sponge can be built from repeated instances of a sponge one level lower and how the complexity (and thus the number of modules required) quickly grows with each iteration of this fractal. The sponges are made of 12, 192, and 3456 units, respectively.